Discover the romance of the Nova Scotia seacoast with a romantic getaway package. Experience the best of the Nova Scotia seacoast with some great seasonal vacation packages. Explore secluded beaches of Nova Scotia’s Eastern Shore on the Marine Drive Trail. An hour from the Cabot Trail, we’re your gateway to Cape Breton Island. Our favourite getaway tips, spring, summer, fall or winter. . Experience authentic Canadian cuisine with a regional Nova Scotia influence. Here are a few of our favourite getaway ideas at DesBarres Manor so you can experience the great tastes, sights and sounds of our special region. We hope our getaway ideas capture your imagination and your desire to explore the Authentic Seacoast™ whatever season you visit. 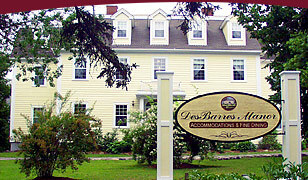 Choose your season to get away to DesBarres Manor Inn with our seasonal top 10 vacation ideas. For travelers seeking a culinary vacation getaway, DesBarres Manor Inn’s fresh menus get seasonal inspiration from the food on Chedabucto Bay. In the summer, our Culinary Getaway Packages get fresh inspiration from the Manor’s organic chef’s gardens. And throughout the seasons of Chedabucto Bay, our Cooking Class Getaway Package gets you into the kitchen to experience East Coast cooking techniques with seasonal culinary treasures from Nova Scotia. If outdoor adventure is the goal of your Nova Scotia vacation getaway, the recreational opportunities on Chedabucto Bay are endless. With more than 600 kilometres of shoreline to explore, you’ll discover secluded beaches and coves, walk coastal trails at the easternmost point of mainland Nova Scotia and drive scenic highways with panoramic vistas of the Atlantic. Ask the Manor team to pack you a picnic lunch so you’re ready for a full day of exploring our unique region of Nova Scotia. We look forward to welcoming you as our guest in 2018 for Nova Scotia accommodations and dining on the Eastern Shore and Marine Drive.